Our research is focused on understanding how age-related changes in the tumor microenvironment contribute to tumorigenesis. This work has led to the finding that senescent-associated stromal OPN promotes tumorigenesis. Given the importance of OPN and other factors secreted by senescent cells (collectively referred to as the senescence associated secretory phenotype, SASP), we investigated how the SASP is regulated. This work has uncovered a potent post-transcriptional mechanism that is governed by p38MAPK. Indeed, we find that inhibition of p38MAPK leads to reduced expression of numerous SASP factors that limits tumorigenesis. Thus, p38MAPK is an important stromal-specific therapeutic target. In addition, this work has led to the development of a novel animal model (fibroblasts accelerate stromal supported tumorigenesis, FASST) in which old stroma is conditionally activated in a young animal. The development of the FASST mouse will have a profound impact on our understanding of tumorigenesis by providing a model that more closely approximates the stroma in aging humans. Indeed, the FASST model allows us to spatially and temporarily control the activation of senescence in a young mouse. Importantly, with this model, we will examine how a critical component of tumorigenesis, age, specifically impacts the stromal compartment thus allowing us to delineate the putative role senescent fibroblasts play in tumorigenesis. Using this model, we find that the presence of senescent cells within the bone increase breast cancer metastasis. Because these senescent cells express a plethora of pro-inflammatory factors and recruit myeloid derived suppressor cells, we posit that the increased bone metastasis is due to the creation of an immune-suppressive microenvironment that allows cancer cells to grow unabated. Currently many anti-neoplastic modalities suffer from the rapid appearance of resistance, the majority of which are due to the plasticity of the tumor cell genome. Our work is likely to uncover novel targets within the stromal compartment of a growing tumor. Given our findings with the p38MAPK inhibitor and the existence of p38MAPK inhibitors currently in clinical trials for rheumatoid arthritis and COPD, our findings suggest p38MAPK inhibitors could be safe and efficacious in patients with breast cancer metastasis. To test this possibility, we obtained an orally available p38MAPK inhibitor and examined its efficacy in a preclinical model. Our findings are exciting and demonstrate that p38MAPK inhibition abrogates the tumor promoting capacity of not only senescent fibroblasts but also cancer-associated fibroblasts. Because the stromal compartment of breast cancer lesions express p38MAPK dependent factors and is predictive of clinical outcome, we are moving forward with additional preclinical testing. Success with p38MAPK inhibition in our preclinical model will set the stage for the design and implementation of a clinical trial in the near future. Upon telomere dysfunction (RS) or cellular stress (SIPS), cells engage the senescence response, which results in proliferative arrest. Senescent cells have a flattened morphology and stain positive for senescence-associated β-galactosidase (SA-βgal). In addition, senescent cells display an altered expression profile that includes many pro-tumorigenic factors collectively referred to as the senescence associated secretory phenotype (SASP). Age is a significant risk factor for cancer and because senescent cells accumulate with age, they may contribute to increases in cancer. Genetic mutations accumulate in tissue over time, leading to an increase in preneoplastic cells in the epithelium. These cells have the potential to progress to malignancy. At the same time, accumulating stress induces senescence in the stroma. 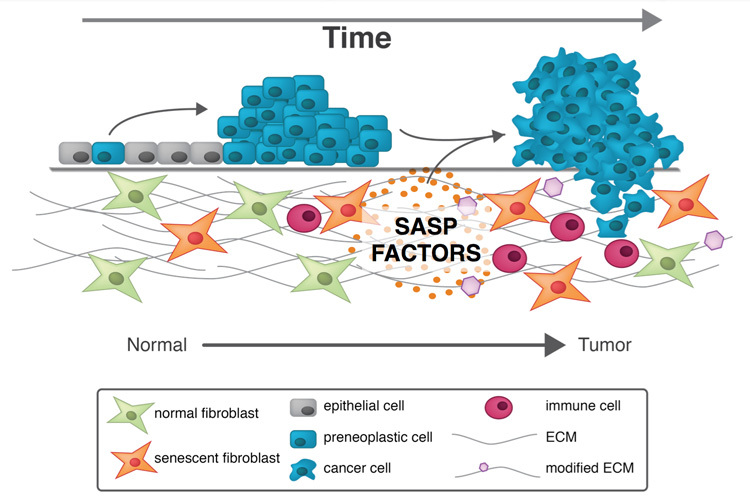 Senescent cells in the stroma secrete factors, collectively referred to as the senescence-associated secretory phenotype (SASP), that promote tumorigenesis. These factors include inflammatory cytokines, ECM remodeling enzymes and growth factors. Preneoplastic cells in the epithelial compartment combined with stromal promotion from is thus postulated to result in a higher risk for invasive disease over time. The senescence associated secretory phenotype (SASP) is regulated both transcriptionally and post-transcriptionally via mRNA stabilization. In young cells, AUF1 and HSP27 coordinate to destabilize SASP factor mRNA. In response to senescence, p38MAPK is phosphorylated and promotes the removal of AUF1 and HSP27, stabilizing SASP factor mRNA. Inhibition of p38MAPK prevents SASP factor mRNA stabilization and reduces stromal-supported tumorigenesis.